Still from Crops. Courtesy of the artist. The Black Box theater showcases rotating exhibitions of contemporary artists who use film or video as their creative medium. Crop (2012, 4 min): The Dutch landscape tradition continues to inspire invention. Known for remote aerial photography in which he pilots his camera with a kite or an elongated fishing rod, Gerco de Ruijter (b. 1961) turns to the found imagery of Google Earth for his video Crops. 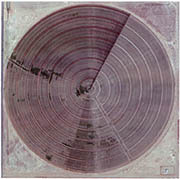 Syncing more than a thousand vertical views of center-pivot irrigation plots in the American southwest to a stuttering, hypnotic score by Michel Banabila, de Ruijter creates a stop-motion animation of the cultivated landscape. Identifiable yet abstract—and devoid of a horizon line—the stills are unified by geometry but made distinct by the workings of both man and nature.